Not 100% sure but the FDA said something like 'we make sure that Diamonds get renovated rooms'. So I guess there are non-renovated rooms left. I did not see any construction though. My room doesn't have an iron or ironing board. I'd prefer to do my own ironing. Any thoughts on whether requesting one might not be possible? The Ararat Park Hyatt is a true Park property. Luxury and service at its best. I enjoyed a four night stay there recently, using a DSU to get a park suite king. On arrival I was met by a manager and then escorted to a room by another. In the room was a bottle of Chianti and a whole fruit platter. The fruit was replenished daily. According to the manager who walked me to the room, I had a refurbished suite. It had a very fancy Toto toilet with electronic controls. There is what consider a bit of a design fault with the shower. It is about 80% enclosed but the remaining 20%-odd is open without any screen or anything. It's very easy for water to bounce of your body or the floor and land outside the shower area. There was an abundance of lights that were all controlled from touchpads and there were electronic blinds that provided a pitch black room at night. The distinctive Park smell was well noted and made me realise it's something that is clearly missing from the Park Canberra. It was a great suite and most enjoyable although the living space isn't great. That said, I sincerely doubt I actually received a "70 to 90 square metre" room, as noted on the website. There were also some significant differences between my room and the photos on the website. Housekeeping was excellent, twice a day. On a couple of occasions I had the DND on but it took less than five minutes for housekeeping to arrive after it was switched off, suggesting it's electronically monitored. The housekeepers I encountered spoke almost no English. The gym was okay but lacked free weights, although the equipment was in very good condition. There is a very pleasant indoor pool and large whirlpool, as well as a sauna. I actually found the sauna too hot, however. Twice I visited and the display said it was 92 degrees Celsius which seems strange. It was too hot to put your bare feet on the bench or the wall. Both the changerooms and the gym have ample supply of free water bottles. The laundry service was very efficient and not too expensive. Breakfast was in the downstairs restaurant where this is a cold buffet and then an a la carte menu, very similar to the Park Paris. As is to be expected the food was superb, outstanding quality and presentation. Check-out was a bit of a dog's breakfast, unfortunately. First, the breakfast charges. Having not been told anything about the breakfast arrangements at check-in, I enquired later on the day of arrival with one of the managers I'd met at registration. The response was basically along the lines of, as a Diamond member who are entitled to breakfast in the restaurant on the second floor and you may also have room service. That's where the information ended. On check-out, I found that I'd been billed between RUB300 and RUB400 (~ USD9 to USD11) on each of the three days I'd eaten in the restaurant, and RUB40 on the day I'd had room service. When I pointed this out the response was that the Diamond breakfast entitlement is for the cold buffet and one item off the menu. On each day, I'd ordered two hot items, thereby exceeding the alleged limit. The RUB40 was because I'd exceeded a room service monetary limit (RUB1950 from memory). The limits were not explained to me and that disappointed me. When I pointed this out the front desk agent waived them, even though I'd insisted they remain. But he was adamant and took them off, noting that it was their error that it was not explained to me. Nonetheless, I still felt as though the hotel had done me a favour. Second, there's an electronic mini-bar which I despise. Each day I placed the complimentary bottles of water in the fridge, which required removing a couple of bottles of beer. Naturally, it was all charged. I told the agent at check-out that there was nothing consumed from the mini-bar but instead of just deleting the line items from the bill, he had to create an individual credit for each item, one at a time. Very time consuming. He also had someone check the mini-bar who reported that I'd consumed two bottles of water and two chocolate bars. I had used one bottle of water but I'd replaced it with the exact same bottle, available in abundance - and for free - but apparently that's no good. The chocolate, however, were another story. There's not a chance on God's green earth that I consumed even one, let alone two. By this point I told the agent to simply add them on. Although the agent had been very courteous and professional throughout, I was disappointed with the process and just wanted to get out of there. About six hours after check-out I received an email from one of the managers I'd met saying the hotel was refunding the mini-bar charges, but with no explanation (ie. was it their mistake or were they doing me another favour?). From Domodedovo airport I took a taxi from the official (or whatever name it was) line in the arrivals hall. It was a flat rate of a very high RUB5200 (about USD145), reduced to RUB5000 when I only had 1000s and 500s. It is a 90 minute journey, however. On the return the hotel arranged a city taxi at the flat rate of RUB3000 (about USD84). danger, I agree with almost everything. 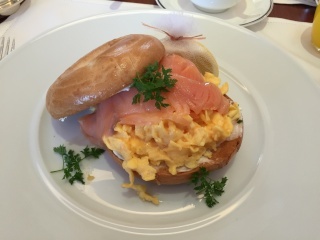 Even had some similar breakfast (told different things different days) and chocolate problems. Everything was eventually taken off, though. One exception from my experience v. yours is that my suite was probably 70-90 sq. m. and appeared the same as pictured online. Just came back from a three nights stay. Used a diamond suite upgrade too but don't think our suite was renovated, even though the front desk agent said they just completed renovation on the entire hotel. There was no electric blinds. Door is still old brown instead the new black ones most of the rooms have. No electronic do not disturb sign. Not sure if we got this room because we used c n p rate. The lay out of rooms was not optimal. The seats were arranged to look into the room vs. out at the Bolshoi theater or the city. Room was big but did not give us the luxury feeling we got from the park hyatt Paris. Breakfast was good. Like danger, we only got instruction on the one hot item per guest limit when I inquired regarding the restriction on diamond breakfast. Service was good. Location was great. Took aeroexpress and metro to SVO. Not too difficult but no escalator some places so had to drag luggage on few stairs. Metro signs were hard to read but eventually you'll find a young person who can speak a tiny bit of English. Will stay at the Park Moscow this August for 5 to 10 nights. Anyone know what the usual Diamond upgrade is and if using a DSU is worth while in this property? Update from PH Moscow. The impressive hotel lobby makes me think of a Grand Hyatt but the experience is definitely Park Hyatt. Got a King Suite thanks to DSU, the freshly renovated suite is absolutely gorgeous. It's not huge, features only one toilet but gives required privacy all around and is amazingly designed with mirror and wooden walls. Room controls are also the best and latest as they light up when you approach your hand. Also, a button makes the bathroom floor heat up, which creates a warm "micro climate" in this spacious bathroom. Gym is big and pretty complete, spa features a turkish hammam which is nice. 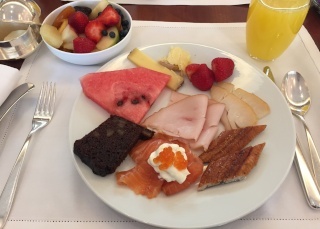 Breakfast spread is small but luxurious, with selections of raw or smoked fish, fine fruit, tasty pastry, and good selection of "a la carte" dishes. Hello Flyer Talkers, I need your help with a situation which I am having a difficult time accepting. I booked C+P room at the Park Hyatt Moscow for my wife and I anticipating that I would utilize a suit upgrade and then add my 2 children 5 and 8 to the reservation. I've never had an issue working this situation out when we are able to book a suite. I've been told by the hotel representative that I am not able to do this and that I would need to book a separate room for the children despite confirmation of a suite for the reservation. The reason and I quote "Please be kindly informed that maximum occupancy for Park Suite is 2 adults only. Exceptionally we may place 1 rollaway bed in the living room, but it will make guest’s stay not comfortable because of the size & shape of the room. Also there will be no space for bed of 2nd child and there is an option of sleeping on the sofa which is not suitable for this, even for child. According to fire safety regulations we may not accommodate whole family in the Park Suite rooms (2 adults + 2 children:5 yo & 8 yo). We do care and would recommend to book option with additional room." Does anyone have any experience with this? Are the Park Suite really that small where a roll away bed or a pull out couch are not sufficient for children to sleep? Does anyone know how I can check the fire regulation requirements for a Hyatt Suite? I booked a Park Suite last summer, and yes, I couldn't see where you would put a Rollaway bed. Maybe squeeze one in, but two is impossible. 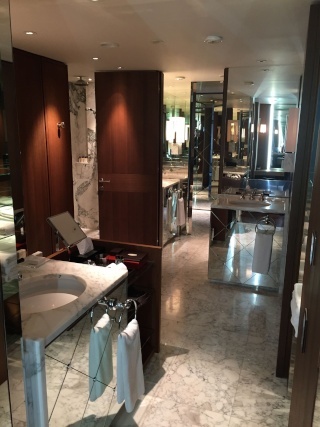 Don't get me wrong, the suite is a beauty and the bathroom is huge. But the furniture used takes up most of the space. It is possible to book a Park Suite King and a twin room and then contact the hotel to request them to be interconnecting. I had great experience with kids at ic - while a bit father from kremlin it has grocery store and deli in the building and plenty of restaurants nearby... no pool though..
Had an overnight here week before last. Booked C&P but didn't use DSU: got just the Park King, renovated, very comfortable, nice Diamond amenity breakfast ( includes more than adequate buffet plus one hot item from the menu). It's very convenient: easy access to metro, close to Belorusskaya for taking the Aerotrain to SVO ( from memory 500 Roubles for a (yellow)city taxi (as opposed to 'official taxi') to get the train , or 50 roubles by metro...metro would be difficult with any significant luggage). 30 second walk to Bolshoi and other theatres, similar to the big upmarket dept store; less than 5 minute stroll to Red Square/Kremlin. There is some major work being done on the theatre next door and on some of the surrounding streets ( but no noise inside the hotel). I had enough currency to get downtown without changing any cash: that was just as well because the booth in arrivals offers a scandalously low rate. However the exchange booths in the city give the official rate ( I used the bank booth in the lobby of the Ritz Carlton, open 7.00am-11.00pm).